And enchant me it did. This was a wonderful book. So much of the time, I check out a re-telling of an old story and find that although it was good, the author brought nothing new to the story. Most re-tellings are duplicates of the original with, perhaps, different character names. The plots are too predictable because of this and you could almost recite it as long as you know the new character's names and the new setting. I read one recently that was like that. April Lindner did something here with Jane that is so much better! She created an entirely new story out of an old one. I don't mean to say she didn't stay true to the original Jane Eyre, because she did. But she also made this into her story, unique and new. It follows the original plot perfectly, and even shares some dialogue with the original, but it doesn't sound or feel like a copy of the original. She handled this so skillfully that I found myself falling in love with "Jane Eyre" all over again. The author stated in her book cover that Jane Eyre was a favorite of hers, and it showed. I was worried at first that Jane would turn out to be a mousy character, since this Jane has a modern setting, while the old one had an older setting where women were more subjugated in society. I was worried how this would translate into a modern version, but Jane was perfectly handled. Yes, she starts out rather beaten down by life and circumstances, but she has a core of strength that is nurtured throughout the story. It was awesome to watch. Nico Rathburn was also a worthy nod toward the original Mr. Rochester. He could be harsh at times, in the beginning, but Jane peals his layers away and he thrives under her attention. I loved watching this character change and grow. 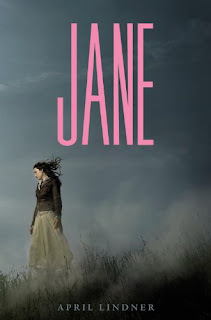 Charlotte Bronte's Jane Eyre gave a beautiful love story to the world, and April Lindner's Jane is now introducing that love story to a new generation of readers. Her effort to recapture Bronte's original magic was a thrilling success that was a pleasure to read. Jane Eyre's always been a favorite of mine too. I was wary also, especially since rewritings of classic novels have not gone well for me in the past... at least not the ones I've read. So this book was a pleasant surprise. I would like to read this one! I loved Jane Eyre and I absolutely love books with a dark, gothic feel. I am a new follower from Book Blogs. Would love for you to check out my blogs if you get a chance and possibly follow back. Hi Laurie, thanks for following! Love your blogs. That is awesome how you have a blog dedicated to interviews!